Alameda County Superior Court Judge Trina Thompson quashed a subpoena Thursday for Oakland Mayor Libby Schaaf to testify in the Ghost Ship criminal trial, finding the defense failed to show Schaaf had personal knowledge of conditions inside the Fruitvale district warehouse prior to the deadly fire of Dec. 2, 2016. "The designees who've been subpoenaed are the appropriate witnesses," Thompson said, referring to officials in Oakland's fire, police and building departments who are expected to testify. Ghost Ship creative director Max Harris, 29, and master leaseholder Derick Almena, 48, who appeared in court wearing dark suits and with their hair in ponytails, have each been charged with 36 counts of involuntary manslaughter for their roles in the underground venue and residence where the fire erupted during an electronic music event. Harris' attorney, Curtis Briggs, argued that Schaaf's knowledge of institutional deficiencies in Oakland's code enforcement systems made her a crucial witness, but the mayor's counsel countered that her statements and policy decisions weren't relevant to the defendants' guilt or innocence. Briggs, as well as Almena's attorney, Tony Serra, have argued that their clients are being unfairly scapegoated in order to deflect accountability away from city officials and property owner Chor Ng. 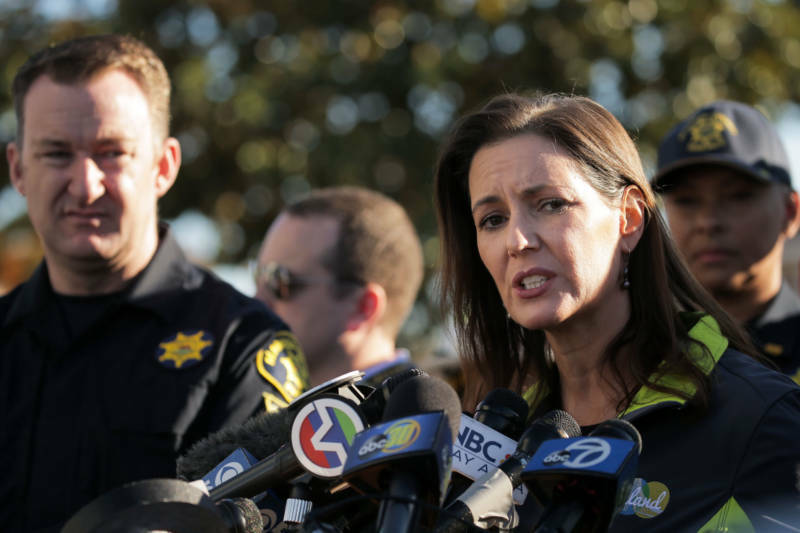 They blame the property owner and city agencies for overlooking unsafe conditions, and subpoenaing Schaaf was seen as part of a defense strategy to diffuse responsibility. Harris and Almena are the only individuals to face criminal charges stemming from the fire. "Had the city inspected the property, these people wouldn't have died," Briggs said. Thompson has prohibited the defense from using the terms "cover-up" and "scapegoat" during opening arguments. "I understand it's their intention to assign blame elsewhere," Schaaf's attorney, Jonathan Bass, said of the defense, adding that "perhaps they're looking to berate [Schaaf] on the witness stand." Bass and co-counsel Christopher Yin addressed several public statements made by Schaaf following the fire, saying they showed opinions and compassion but not personal knowledge relevant to the trial. Briggs argued that Schaaf's comments showed she knew of a 2014 grand jury report criticizing the city for lax fire safety enforcement. "What's material is a mayor presiding over a city cited by a grand jury for a deficient fire inspection system," Briggs said. "That's an extremely unique fact." Briggs also accused Schaaf of attempting to influence the jury pool and prejudice the public against his client out of concern for the city's civil liability, saying she interfered with Harris' right to a fair trial. Dozens of plaintiffs have adopted a pending civil lawsuit naming individuals and entities, including the City of Oakland. But the judge in the case, which is expected to begin with opening statements at the end of April, based her decision to quash on Schaaf's lack of a connection to the Ghost Ship itself. Without a "direct nexus to the event," Thompson said, Schaaf is not an appropriate witness. Thompson also issued a $50,000 warrant Thursday for defense witness Sharon Evans for failure to appear. Jury selection for the trial continues next week, with a hearing scheduled Monday.